Cubs pitcher Kyle Hendricks is Sunday’s Box-Toppers Player of the Day. Also Sunday, Rays pitcher Blake Snell maintains his fourth-place spot in Box-Toppers season player rankings after earning American League Player of the Day honors. Nationals pitcher Max Scherzer is Friday’s Box-Toppers Player of the Day and regains the lead in season player rankings. Also Friday, Red Sox pitcher Chris Sale rises to second place ranking in Box-Toppers season player rankings after earning American League Player of the Day honors. Plus, three players in Box-Toppers “all-time” top 10 in career points earned Player of the Game honors Friday—Scherzer, Dodgers pitcher Clayton Kershaw and Diamondbacks pitcher Zack Greinke. 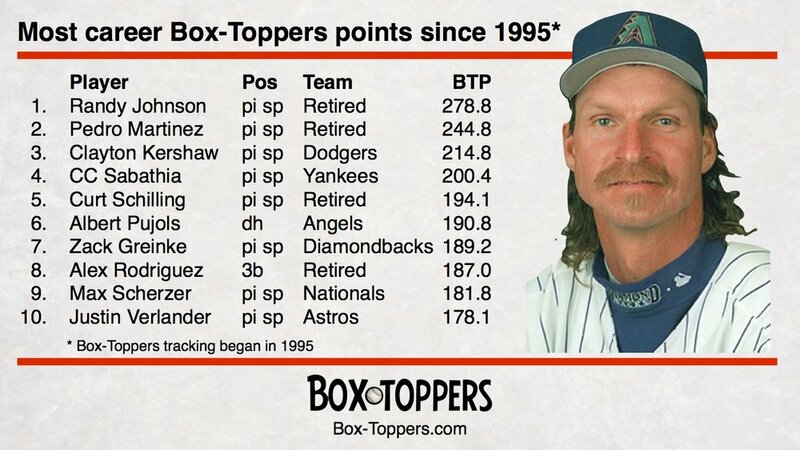 Diamondbacks pitcher Zack Greinke is Sunday’s Box-Toppers Player of the Day and rises to seventh place in “all-time” career Box-Toppers points, passing Alex Rodriguez. Also Sunday, Red Sox pitcher Chris Sale rises to third place in Box-Toppers season player rankings after earning American League Player of the Day honors. Diamondbacks pitcher Zack Greinke is Saturday’s Box-Toppers Player of the Day. Also Saturday, Astros pitcher Gerrit Cole rises to seventh place in Box-Toppers season player rankings after earning Player of the Game honors. J.D. Martinez, Zack Greinke and Joc Pederson are among the players rising into Box-Toppers’ All-Star teams in the past week. With Major League All-Star voting underway, here is a look at who is leading at Box-Toppers points at each position in both leagues. Astros pitcher Lance McCullers Jr. is Thursday’s Box-Toppers Player of the Day. Also Thursday, Phillies pitcher Aaron Nola rises to ninth place in Box-Toppers season player rankings after earning National League Player of the Day honors. Greinke struck out seven over six scoreless innings, allowing two hits and no walks, in the 7-2 win over the Pirates. Mitch Haniger, James Paxton and Aaron Nola are among the players rising into Box-Toppers’ All-Star teams in the past week. Giants pitcher Andrew Suarez is Saturday’s Box-Toppers Player of the Day. Suarez struck out five over seven scoreless innings, allowing three hits and no walks, in the 2-0 win over the Phillies. Padres pitcher Jordan Lyles is Tuesday’s Box-Toppers Player of the Day. Also Tuesday, Twins pitcher Jose Berrios rises to fifth place in Box-Toppers season player rankings after earning American League Player of the Day honors. Astros pitcher Charlie Morton is Monday’s Box-Toppers Player of the Day and rises to fifth place in season player rankings. Morton struck out 10 over 7 2/3 innings, allowing one run, two hits and two walks, in the 2-1 win over the Yankees. Morton earns 2.0 Box-Toppers points for being Player of the Day, giving him 6.4 for the season. With his rise to fifth place, Astros pitchers again occupy four of the top 10 spots in Box-Toppers season player rankings.